I think The Amazing Spider-Man is a great superhero movie, and I personally really love it. Despite the negative reputation it has gained in the years following its release, I find myself thoroughly engaged in the story and relating with the characters. Unfortunately, it also feels incomplete due to studio interference, and as a result, kind of redundant all things considered. Removing key scenes took away not only the freshness of the plot, but also some of the story and character depth. 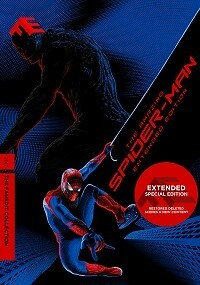 That is why I wanted to reinsert the deleted scenes that were made available to us so that we can all have a more complete Amazing Spider-Man experience. and everyone who gave their support and feedback both on and off the forum. I used Adobe Premiere Pro and Adobe Encore CS6. While editing not only did I insert most of the deleted scenes but I also took some minor liberties by cutting some stuff. *Regraded the movie to look brighter and more colorful. -Cut Peter pretending to be someone else. He just sneaks into the intern group. -As a result of the previous change, Peter getting bitten has been moved up to the Spider Room and Gwen taking his badge away has been cut. +Added Uncle Ben's alternate death scene which was a lot more tragic. +Added deleted scene of Connors giving his condolences. +Added the POV shot from the teaser trailer for a more grandiose superhero entrance. -Cut Peter bending the goal post with the football. -Cut Peter seeing newspaper photo ad. +Added deleted scene with Connors and his son. +Added deleted scene where Peter follows Connors to the sewers. -Cut Connors montage that was spliced together with different unused scenes and newly recorded voiceover. +Added deleted scene where Connors talks to himself. +Added deleted scene where Dr. Ratha tracks Connors' location. *I did not add deleted scene with the two random girls at the bathroom. +Added deleted scene where Connors asks Peter for help. This was re-edited to remove the greenscreen arm. *Reworked scene where Peter asks Gwen for an antidote. Now Peter sends a voice message instead of calling. +Added critical "All the Power You Feel" deleted scene at the sewer. +Added deleted scene where Peter makes breakfast with Aunt May.